2. Roughly chop the almonds and hazelnuts and tip on to a baking tray. Lightly toast the nuts in the oven for about 4 minutes. Meanwhile, roughly chop the raisins and dried cherries. 3. Tip the caster sugar into a small pan and add 1 tablespoon of water. Set the pan over a medium heat to dissolve the sugar. Bring to the boil, simmer for 1 minute until syrupy, add the rum and bring back to the boil. 4. Add the dried fruit to the toasted nuts and mix well. Quickly pour over the hot syrup and mix to coat the fruit and nuts. Allow the mixture to cool for a moment and then, using your hands, shape the fruit and nuts into 12 evenly sized mounds. Arrange on non-stick baking parchment and leave to cool. 5. Melt the chocolate in a heatproof bowl over a pan of barely simmering water, making sure the bottom of the bowl doesn’t touch the water. Remove from the heat and stir until smooth. Place one nut cluster at a time on the tines of a fork and dip into the melted chocolate to cover. Lift out of the chocolate, tapping the fork on the side to allow any excess chocolate to drip back into the bowl. 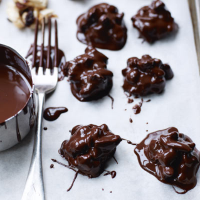 Place on baking parchment and repeat until all of the clusters are coated in chocolate. 6. Leave in a cool place until the chocolate has set and hardened before serving.